We flew out to Colorado this week to visit my family. Because I worked both Christmas and New Year’s, there was really no good time to make the trip west… and of course now school is starting and work is ramping up. But we’ve had a WONDERFUL time. 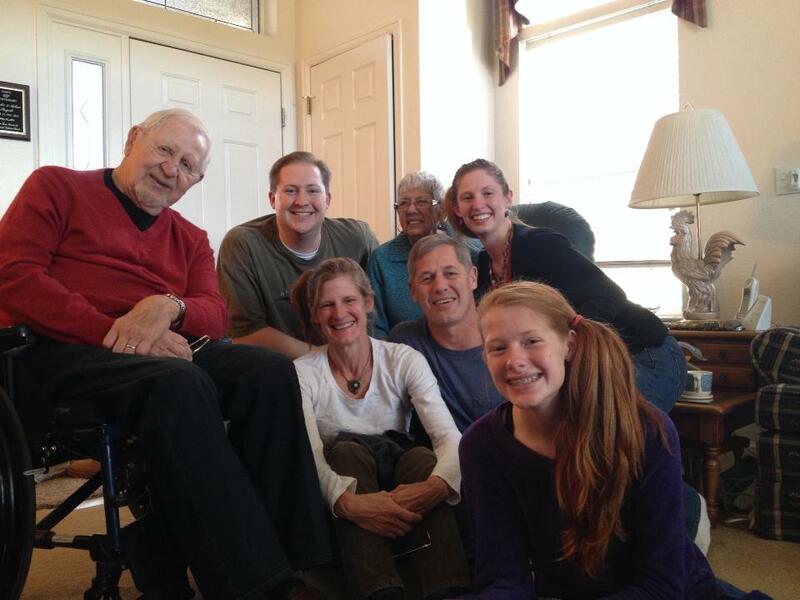 First, we had a great visit with my grandparents – a real holiday-style ham dinner! I don’t feel so bad about missing the Christmas and New Years’ feasts after enjoying some home-cooked green bean casserole. Please note the girls’ side ponytails!!! 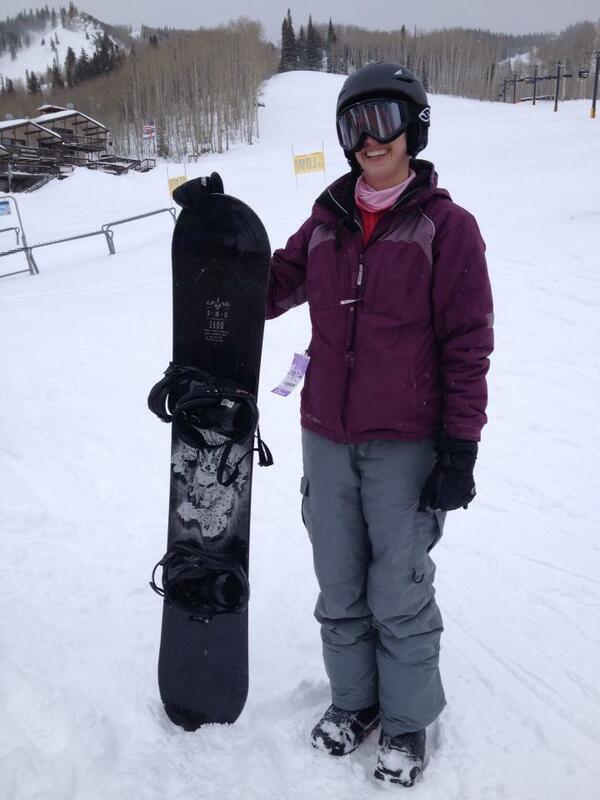 Yes, I learned how to snowboard!! In perfect powder conditions which were great for spending lots of time on my behind (fallboarding)! I actually found snowboarding pretty fun because it is so much about core and balance. The not so fun part: you can’t hike easily with a snowboard. The second day I did a pretty flat green run with my family and ended up hiking up hills 4 times because I either fell or ran out of speed (hikeboarding). Except for the first time, I also fell every single time I got off the lift. Every. Single. Time. Let me know if you have any tips! But all that time spent sprawled in the snow was worth it for the feeling of drifting like a falling leaf down the hillside. No poles. No crossed skis. No baggage. Just me, my board, and the mountain. After two days in the hills, we had to head back to real life. Chris, my brother and I headed to Golden for a day and met my grandmother at Ali Baba for lunch – delish! 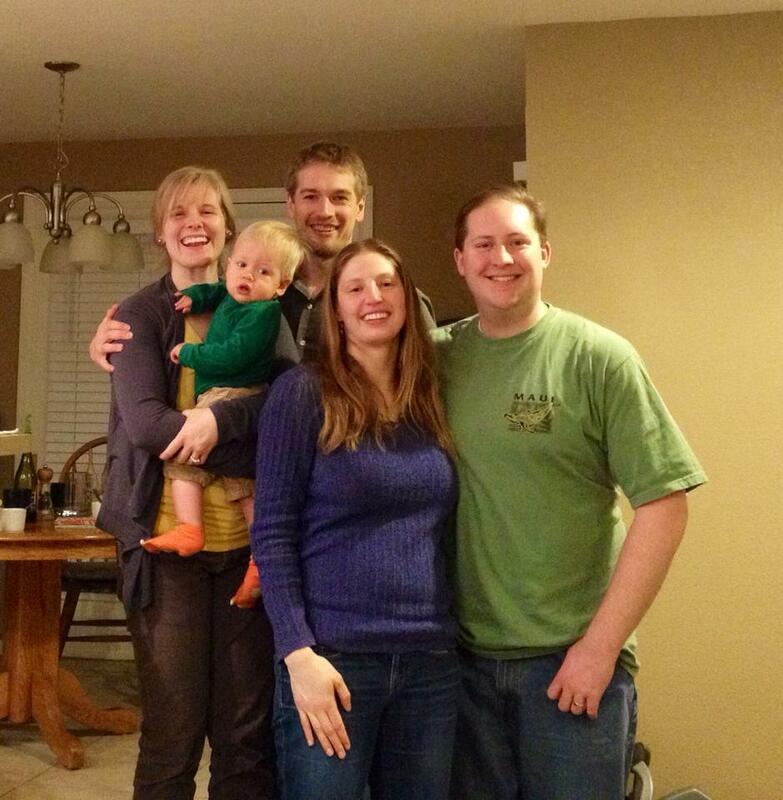 Then we visited some friends from medical school and their baby in the Stapleton area. Those babies grow up so fast! Yesterday my mom brought me along to observe her work as a school nurse. She works at a school for kids with past attendance or disciplinary issues, and I was so impressed at how their school works to accommodate the kids and families. They are working hard to help people and making a difference at a critical time in these kids’ lives. Today we went to the Denver Art Museum and saw the Passport to Paris exhibit. It was great to see such a variety of styles and times – my new favorite is British artist Sisley. They had a great Pissaro section with paintings from each decade of his art and it was cool to see how his style evolved and mellowed, from sharp geometrical shapes and “wild-urban interface” pieces to more abstract nature scenes. They also had some cool juxtapositions – a scene of Montmartre when it was all country, and a couple scenes of the wild nightlife there a few decades later. While we were at DAM, we also admired some of Thomas Moran’s watercolors and chromolithographs from Yellowstone. We finished our time downtown with some wine and cheese across the street. Lest you think that all we do is travel fun places and eat, Chris also made Mario Batalli’s baked ziti last night and in the process discovered that the pipes around the garbage disposal were clogged. Dirty dishwater was pouring everywhere; buckets, towels, flashlights were produced. But nothing could faze the Bugoshes! My dad ran some diagnostics, my mom snaked the pipes and upon discovering that it was beyond our level of expertise, we turned to Music Man to help Anna practice for the school play. The new Music Man (2003) is pretty good, I must say, especially since we live so close to Iowa. And the plumber is on the case right now. So it’s not ALL fun and games… but we usually end up having fun anyway!